Just in time for GDC '09, Ubisoft in Montreal have announced a new real-time strategy IP named R.U.S.E., developed by Eugen Systems, creators of the positively received strategy title Act of War: Direct Action. R.U.S.E. was demonstrated today for the first time in public at the Intel booth during the Game Developers Conference in San Francisco. The game plays upon the theme of deception (thus the title), and will test players' ability to fool and outwit their opponents to victory. "Deception is present everywhere in our daily lives: in media, politics, even relationships, but we also realized how important it was during wartime. R.U.S.E. is the game where each player uses their intelligence service to anticipate the moves of their opponent; this makes some information available about the enemy. Deception is also a matter of avoiding being spied on: lying, fainting, hiding, and faking…you’re the only one who decided when it’s time to reveal your real forces!!! That’s like poker!!!" 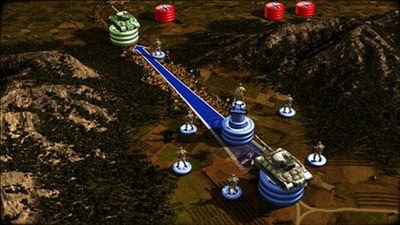 The game also employs a new proprietary in-game engine called IRISZOOM, which according to Ubisoft will allow for smooth, rapid transitions from a birds-eye view of the entire conflict, down into the heat of the battle and vice versa. Ubi did a commendable job reinventing the RTS with EndWar last year and R.U.S.E. looks set to do it all over again. I like the board game look to the presentation so far. Yeah, I am looking forward to seeing more of this game. I'm quite used to playing traditional RTS games which focuses on strategic resource management, building placement, unit creation & upgrades, and positioning. I like the new twist of adding deception and tomfoolery into the mix. I think mostly I'm eager to deploy an entire army of mannequin tanks towards my enemy, only to flank them with bombers while their defenseless. Yes, that sounds great.